For those who followed my extreme highs and lows while in Cape Town- thank you. Your support meant so much to me. I am now taking you with me to Spain. To Madrid. I leave Connecticut in less than one month. Back up. I'm going to Spain. Why? When? How? When I was finishing up my masters in Cape Town this spring, Nacho showed me this program called Auxiliares de Conversación. The program allows Americans, Canadians, and other native English speakers to live in different areas of Spain for about ten months, teaching English in elementary and high schools part-time, with health insurance and a monthly stipend granted through the Ministry of Education of Spain. This wonderful opportunity was placed before me- a chance to work on my Spanish, to live the life of a Madrileña, a way for us to finally be together. It made sense to apply, so I did. And after months of anxiously waiting, I was officially awarded the academic grant. My placement: Madrid. Since that great day, when I rushed home to have a Skype celebration with Nacho (which consisted of victory dances and hugging my computer) my life feels as though it is moving in fast-forward. Gathering documents for my visa, preparing for my move, saying goodbye to family and friends. I have had just enough time to soak up some summer sun, fatten up on mom’s amazing dinners, and fall in love with the crickets every night. As my time at home is drawing to an end, I am starting to feel restless- there is only so much preparing one can do. But for now I am reveling in quiet evenings in Salem, CT and the ease of familiarity with my routine at home. 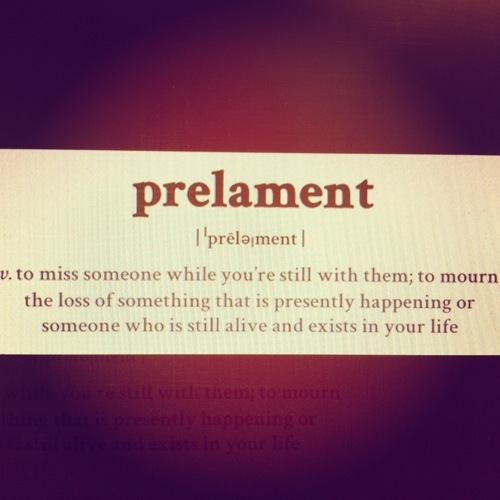 This word means so much to me. It is how I always feel with Nacho- our short visits together always seem to end before they begin. But in this month, until mid-September when I pick up and leave, I am prelamenting for my home. I am missing the smell of my kitchen, the dent in my car, the comfort of my bed while I am still in it. It is a strange feeling and one I have a hard time dealing with, but as sad as I am to leave the people and place I love, I am just as happy to soon be with the one I love, to start a new and exciting future. To have adventures, to learn, to grow.